'A good chair is the basis of many a long and magnificent evening'... The incredibly comfortable Tivoli chair certainly fits the bill. Introduced in the 1950's to the Restaurant Groften at Tivoli (the famous pleasure garden in the heart of Copenhagen), this chair has the advantage of not taking up much space – all the better for getting more people around a table. In contrast, the Liggestolen Lounger, first made in the 1930's, was made for a different kind of comfort. Legend has it that it was produced for hospital patients who were convalescing. The lightness of the lounger, when folded, made it easy to take it in one hand whilst helping a patient with the other. Both have now been re-isssued by a Danish company. 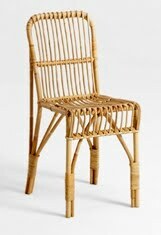 The protoypes were made on the Danish island of Fyn by one of the last remaining basket-makers. 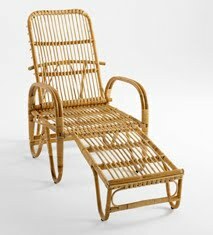 They were then taken to Indonesia, 'the country of rattan', for handmade production. The chair and lounger have already been shown in World of Interiors and Monocle. Contact Mar Mar Co. for more details.